Spring is finally here, which means it’s time for the Boulder Farmers Market! This nonprofit organization brings the best of local farmers, artisans, musicians, and other vendors to Boulder twice weekly starting in April. Here’s everything you need to know in order to get the most out of these events. 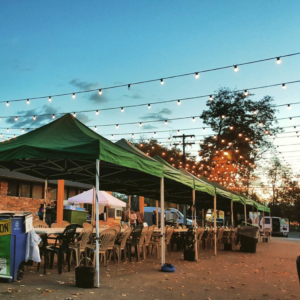 Every Saturday from April 7th to November 18th,make your way to 13th Street between Canyon and Arapahoe between 8am and 2pm for the weekend market. This event has live music, and the second Saturday of every month features artisanal shows. Not available on Saturdays? Browse the market every Wednesday from now through October 3rd from 4-8pm. Wednesday nights are geared more toward adults, with a beer garden that rotates breweries weekly. While you’re there, cross the street to Central Park to practice a little yoga with All Terrain Yoga. The best part of the Boulder Farmers Market is its diversity. There are over 50 participating farms, and that’s just the beginning. Eight local ranchers bring a selection of humanely-raised meats; four apiaries supply honey and beeswax products while sustaining bee populations; and there are over 75 other local pre-packaged or artisanal vendors. This means that the Boulder Farmers Market can be your one-stop-shop for anything from produce to chocolate and candles to gelato. Be sure to bring reusable tote bags so you can stock up with goods from Colorado’s finest! In addition to all the products available for sale, the Boulder Farmers Market also welcomes local nonprofit organizations. From composting to car-sharing, participating groups offer many ways to get involved with and connect to the Boulder community. There are some exciting new features at this year’s market, alongside some rules to keep things running smoothly. One of best aspects of the market is the live demo from local chefs. Chefs coordinate with market managers to purchase produce and prepare food with step-by-step instructions at the center of the market. If you want to get involved with the markets, check out volunteering opportunities, or consider becoming a founding member. Interested in learning more about events or opportunities? Be sure to subscribe to the Market newsletter. And remember, while Boulder is a town that welcomes all, please note that four-legged friends are not allowed at the farmers markets to ensure product quality. The Boulder Farmers Market is an excellent way to support the community, local small farms, and artisans throughout the state. Take advantage of both the Saturday and Wednesday markets to enjoy all the wonderful artisans, musicians, farmers, and community organizations!